Discussion in 'Deck Building' started by Flaxative, Jan 28, 2014. Hey guys. I’m here with some deckbuilding advice. Lately, Card Hunter great Scared Little Girl (of 3DC fame) has been running a new and terrifying build: Insightful Elves. The Elves are all about hitting enemies with a lot of revealed cards in hand, and hitting those enemies hard. The key to SLG’s build is Devastating Blow. With a little setup, it can almost deal as much damage as Obliterating Bludgeon! I know this may sound frightening, but keep it together. With my advice, you can minimize the impact of SLG’s combo and effectively counteract the entire point of her build. Here’s the perfect counter, the perfect way to have fewer revealed cards in hand: Lateral Thinking. Equip your humans with Trained Tactics. This is a fantastic item, as it gives you TWO Lateral Thinkings. The downside is that it’s legendary, so maybe some of you scrubs don’t have it yet. I recommend checking Randimar’s Rarities every week. If you see the blue carrot, buy it. If you don’t have the gold, sell some of the legendaries you do have. Vibrant Pains, for instance. 100 gp is a lot better than a weapon that just has six move cards on it. If you really can’t scrap the funds together, you can go for Flexible Tactics. Advanced Battlefield Training requires an ally within Line of Sight to empty your hand, but it’ll do the job often enough. If you’re looking for a warrior helmet, I recommend Cap of Soaring. It’s pretty easy to ditch your Flight Aura, and the Battlefield Trainings function like Lateral Thinkings that rely on nearby allies—you play Battlefield Training, discard a card, and then draw a card on another character. As Dr. Bombay sings, “Buy 1 for 2—special price for you!” The main problem with this item is that it requires warriors. I’m a bit worried that warriors can’t pack the consistency that wizards and priests bring to the table. Fumble might look like a poor man’s Lateral Thinking—it’s very similar. You play Fumble, discard a card, and then draw a card to replace the Fumble. It’s common, and black quality, so it must be worse than Lateral Thinking, right? Wrong! Because it’s a trait, it effectively cantrips, allowing you dispense with more cards before your opponents strike you. It’s clearly a gold quality upgrade to Lateral Thinking in disguise. You do lose a bit of selection, but your deck is pretty consistent at this point. I recommend outfitting wizards with Unwieldy Staff—if the cards on it weren’t undervalued, it would probably be a level 18 epic. The fact that it’s tokenless right now is, in a word, imba. Cowardly and Dropped Guard are inconsistent. Sometimes they don’t work, and you don’t get to dump any cards. Sometimes they work wonders, and push as many as THREE other cards out of your hand! Dropped Guard has really poor itemization, however. We find it on only one wizard item, Robes Of Forgetfulness, which is far from the power house that is Robe Of Lightness. If you have Shield Of The Aggressor, you can put it on your priests, but I don’t recommend running warriors just to run Dropped Guard. Cowardly, on the other hand, shows up on a bunch of elf skills, if you’re scared of how potent your humans will be. It also appears on the best boots in the build (Toad Boots) and the strongest divine item (Tarnished Prayer Beads). The latter brings me to Wavering Faith—another Lateral Thinking in disguise, yet weaker than Battlefield Training but still playable. It’s the main reason priests are playable. I’m going to present some sample characters now. The point here is you abuse traits on Runestone and Robe of Lightness in order to achieve maximum consistency. Winds Of War is good for getting rid of your own Cloth Armor (assuming you're running multiple of these guys, and hey, why not?). You only have a few dead cards in your deck, the attacks on of your staves and the Walls of Fire. The good news is you can cast Wall of Fire without targets, so it’s easy to pop that one before you it adds to your opponent’s Devastating Blow. “But Flaxative, why don’t I simply leave my divine item slots empty for maximum Wavering Faiths?” Remember, Cowardly is often just as good, and the Inspirations actually increase your consistency and the density of discard effects in your deck. I think this build is slightly less effective than the wizard, but if you love priests for some reason you should try it out. Now that’s using the old noodle. ParodyKnaveBob, Sentient_Toaster, Fifjunior7 and 11 others like this. I guess this strategy is flawless, since none of you have suggestions or criticisms. I'm glad to have been of such service to the deckbuilding community. ParodyKnaveBob, Fifjunior7, Pengw1n and 1 other person like this. Could you explain why I see no mention of Superstitious? 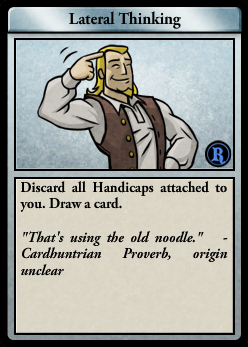 Cards like lateral thinking seem nice and all, but you're assuming you have time to play them all. Remember it is elves you're up against. Those sneaky pointy ears are up in your face in no time. With superstitious, you can be sure that even if one of your characters falls to the mauling of those crazy elves, your other characters won't fall for the same tricks. Better yet, if you inadvertently kill one of your opponent's elves by stray wall of fires, superstitious ensures that you stick with the strategy the deck was originally built for. ParodyKnaveBob, Fifjunior7 and SuperBadShockSkag like this. Good one, but how easy is it to get on your dudes? Are there any elf racials with 2x Superstitious? Our theme remains intact, and we get to add in the potential blowout card that is Superstitious. Consistency is once again key here, as this warrior sports a wizard-like 12 traits! I think the party is now complete. I just found my second Trained Tactics, so I'm getting closer. hi there, I'm a noob. This idea sounds awful... most of those cards sound like they're downright negatives. Is this a gag? or am I just too novice to comprehend the majesty of discarding all your cards all the time? even if you take less damage from devastating blow you'll still have no cards to do anything with? Fifjunior7, CT5 and Flaxative like this. But you are right - the cards in the pictures of the 1st post are terrible cards. Psh, lord feleran doesn't know anything. SLG isn't playing right now, but will be back once their is new content. And besides, if you aren't playing Insight or Counter-Insight, then you are clearly-low tier anyways. A guy played Lateral Thinking against me the other day. Until that point, I'd felt pretty good about my chances... but when I saw that card, I began trembling. ParodyKnaveBob, doog37, CT5 and 1 other person like this. Trembling? Don't hold it in, just LOLOLOLOLOLOL! Who cares if milk comes out your nose? CT5, neoncat and Flaxative like this. 100 gp is a lot better than a weapon that just has six move cards on it. doog37 and Flaxative like this. Superstitious is one of those cards, like Duck (which you definitely don't want in this build, as it captures your opponent's cards!) that only works in certain instances. While Duck relies on a 4+, Superstitious relies on you killing one of your opponent's character for the full value of the card to be realised. And sometimes, you just can't position your characters to get those killing blows in. So, when faced with this scenario, there's a solution which doesn't appear obvious at first: target one of your own characters with your attacks. Most build have a character who doesn't really do that much, be it a cleric sitting up the back and spamming Mass Frenzy, or the mage who Gust Of Wars characters around a piddling square or two. If that's the case, it's time to show your opponent who's boss, by sacrificing that character. With a lucky enough draw, you can kill one of your own characters with the second, and watch as the third discards his/her entire hand! Then settle back and laugh maniacally as those enemy Devastating Blows deal only 7 damage. When I finish designing this counter build, I plan to call it the Judean Peoples' Front Crack Suicide Squad: a name sure to strike fear in the hearts of those who encounter it. Pyrious, ParodyKnaveBob, Slayer696 and 1 other person like this. [When I finish designing this counter build, I plan to call it the Judean Peoples' Front Crack Suicide Squad: a name sure to strike fear in the hearts of those who encounter it. Sorry, Happenstance, but the Squad are so fanatically fast they already beat you to it. I'll be sure to get some support for this build printed in the next expansion, and then we can hold another Most Stylish.